John and I have grown to love something about his parents we both never expected: their adorable passion for margaritas. Half the times we visit them we head over to this amazing Mexican restaurant near their home whose renowned margaritas come in glasses big enough to be a goldfish’s abode. And whether it’s a summer day spent barbecuing in the backyard or a family vacation by the beach, my parents always come equipped to whip anyone up one of these salt-rimmed delights in minutes. Now last Thursday was International Margarita Day, so now’s clearly as good a time as any to sit back and enjoy one of these delicious drinks. And while can’t release the secrets of John’s parents’ recipe, I have something even better: an original recipe from cocktail expert Megan Radke, from none other than our beloved last home, Seattle. She’s currently competing in Patron’s 2018 Margarita of the Year competition, so this is the real deal. Margaritas often come in an impressive but overwhelming variety. Some, like my husband, like them as classic as possible—just tequila, triple sec, and lime juice without the frills. But what’s surprising is that you can stretch and twist the basic building blocks in a number of directions, but the margarita rarely breaks. It’s a very versatile cocktail that often improves with innovation, and that’s exactly the case with this recipe, which Radke calls the Skyline Margarita. It begins with Patron silver, whose citrusy sweet smoothness lends a wonderful foundation. Next is Patron Citronge Orange (a liqueur), lime juice, and blackberry shrub, which impart an acidic, bitter, and tangy edge. The drink is finished with cayenne chili, both as syrup and salt, which come alongside the silver’s peppery palate for an extra punch. Once garnished with orange zest, this concoction is a delectably aromatic cocktail. This is a sponsored post and, as always, all opinions are my own. Thank you for supporting the brands that support The Broken Bread. 1. Add all ingredients to a cocktail shaker and shake with ice to chill. 2. Fine-strain through a mesh strainer over fresh ice into a cayenne-chili salt-rimmed rocks glass. 3. Garnish with orange zest. 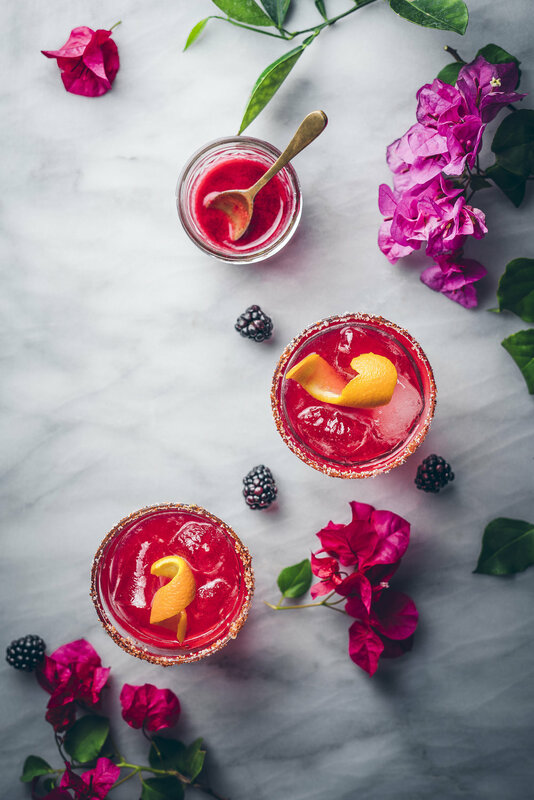 *Blackberry shrub: Combine equal parts blackberries, cane sugar and red wine vinegar in a blender, blend until liquefied, then strain out solids. **Cayenne-chili syrup: Combine 1 cup sugar, one cup water, 1 teaspoon chili powder, 1 teaspoon cayenne in a saucepan and bring to a simmer. Once the desired flavor is achieved, strain out solids. Alternately, use .25 oz simple syrup, a slice of cayenne or other hot pepper, and a pinch of chili powder. ***Cayenne-chili rim: 4 parts kosher salt + 1 part chili powder +1 part cayenne.